Kistler's donations are the first substantial financial backing Pioneer has received since the Canadian race scientist J. Philippe Rushton took over in 2002 as the organization's president. (Rushton is best known for "research" supposedly showing an inverse relationship between brain and genital size, with blacks being larger in the latter.) Kistler said he holds Rushton "in high regard for the courage he demonstrates in pursuing research in the field of human differences." Prior to Rushton taking the job, the fund was slowly drawing down its resources. Aerospace scientist Walter Kistler lauds the controversial work of race scientist J. Philippe Rushton, president of the Pioneer Fund. The Pioneer Fund has a long and sordid history. Created in 1937, its original mandate was to pursue "race betterment" by promoting the genetic stock of those "deemed to be descended predominantly from white persons who settled in the original thirteen states prior to the adoption of the Constitution." Its original endowment came from Wickliffe Draper, a racist scion of old-stock Protestant gentry who despised unions and helped fund opponents of desegregation in the 1950s. During the 1950s and 1960s, Pioneer grants were given to the International Association for the Advancement of Eugenics and Ethnology, which brought together academic defenders of segregation in the United States and apartheid in South Africa. Other, more recent grantees included Nobel Laureate William Shockley, a physicist at Stanford best known for his "voluntary sterilization plan" for individuals with IQs below 100. 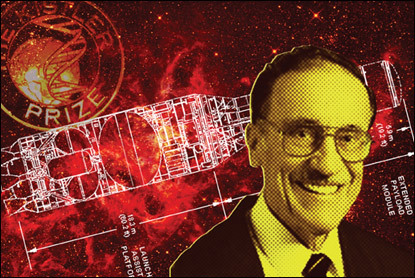 Kistler, 89, is a Swiss physicist who came to the United States in 1951 and worked on Bell Aircraft's most advanced rocket projects. A pioneer in electric measurement technology using quartz crystals, he later founded several companies, most notably Kistler Instrument Corporation and Kistler Aerospace. Kistler reportedly helped fund the Ansari X Prize to support privately built manned space vehicles, which awarded $10 million in 2004 to SpaceShipOne. He was inducted into the Aviation Hall of Fame in 1998. Kistler has long associated with race scientists. In 1999, he traveled to London for meetings of the Galton Society, which was formerly known as the Eugenics Society. (Eugenics is the "science" of improving the human race through selective breeding that was discredited by its strong association with Nazi ideology and the Nazis' murder of the mentally "deficient.") Scheduled to speak there were Arthur Jensen and Glayde Whitney, but protesters shouted down the meeting. Whitney, who until he died in 2002 was a controversial genetics expert at Florida State University, was also the author of a fawning introduction to David Duke's 1998 racist and anti-Semitic autobiography, My Awakening. Whitney described the former Klansman's 717-page tome as "a painstakingly documented, academically excellent work of socio-biological-political history that has the potential to ... change the very course of history." Kistler defended the donation to Jensen, calling him "one of the foremost respected scientists on the planet when it comes to the study of human differences, specifically human intelligence." Most other experts in the field disagree, and some say Jensen has ignored whatever evidence contradicts his ideas. But Kistler insisted that Jensen "doesn't have a racist bone in his body" and "is and will always be one of the more distinguished winners of the Kistler Prize." Roger Pearson, whose Institute for the Study of Man has been one of the top Pioneer Fund beneficiaries over the past 20 years, is another example of an extremist supported by the fund. Using the pseudonym Stephan Langton, Pearson edited The New Patriot, a short-lived magazine published in 1966 and 1967 to conduct "a responsible but penetrating inquiry into every aspect of the Jewish Question." Its articles carried such titles as "Zionists and the Plot Against South Africa," "Early Jews and the Rise of Jewish Money Power" and "Swindlers of the Crematoria." To this day, Pearson still publishes race scientists in his Mankind Quarterly, whose editorial board features Pioneer Fund board member and grant recipient Richard Lynn. In recent years, the fund has mostly been giving grants to its own board members and a few other groups that are not embarrassed to be the beneficiaries of its racist charity. For example, from 2002 to 2006, board member Lynn's Ulster Institute for Social Research received $286,372. During the same period, Rushton, the fund's president, received, through the University of Western Ontario where he teaches, $301,326. The other big beneficiary of Pioneer handouts is American Renaissance, a racist newsletter published by Rushton's close friend, Jared Taylor, who recently argued in its pages that blacks are incapable of sustaining any kind of civilization. Taylor's journal focuses on eugenics and alleged race-based differences in intelligence. Given Kistler's prolific scientific experience, the Pioneer Fund seems an especially odd choice for his largesse because it does not employ scientific norms. Pioneer has no peer review process for judging grant applications, and its board decides on its own whether a particular research proposal merits funding. In addition, once a grant is awarded, there is no requirement that the grantee provide proof that they undertook the work for which they were given funding. They are not even required to acknowledge that Pioneer backed the work. These are atypical practices for scientific grantmaking institutions. Though most of the Foundation for the Future's (FFTF) work is unrelated to race science — the foundation's main undertaking is holding several seminars a year on such things as climate change, energy security, and other important matters — Kistler's politics have leaked into FFTF's programming. In 2001, Pioneer Fund board member Lynn received a $15,000 grant for a study entitled, "Is Fertility for Intelligence in the United States Dysgenic?" Kistler is concerned that the United States is in a dysgenic downward spiral, where persons with "negative social behaviors and lower intelligence" have more children than college graduates. Kistler has written that he believes this process is breeding successful genes out of American society and could lead to the "decay of our civilization and culture." Kistler told the Report that, although he is concerned about dysgenics, his reason for donating to the Pioneer Fund is "for scientific research in the field of human differences." He dismissed criticisms of the organization as applying only to its "history and past." And he said that he has "never personally discriminated against anybody" nor "acted on any of the conclusions of the research into human differences." His closest colleagues, Kistler said, are "a Jew, an East Indian, and a woman." FFTF Executive Director Bob Citron, who was CEO of Kistler Aerospace in the 1990s, told the Report that the foundation is "anti-racist" and that "Kistler has one vote on the board of trustees and they don't allow his personal views to influence the foundation." He explained that Jensen was awarded his prize partly because the advisory panel considers "how much courage the person has in fighting his colleagues and persons who make fun of his or her research" and because Jensen had devised the "g factor" intelligence measurement. Citron said that Kistler has over the years brought race scientists to the foundation, adding that Kistler included Glayde Whitney in some of FFTF's programming. Whitney also is featured in one of FFTF's booklets as a "Scholar Participant." Though Whitney spoke at the Galton Institute event Kistler attended in London in 1999, Kistler told the Report that he did not invite him to FFTF and that FFTF has "nothing more to do with Glayde Whitney." Asked about the fact that Whitney penned the introduction to David Duke's autobiography, Kistler told the Report, "I am not especially concerned one way or the other that he did." 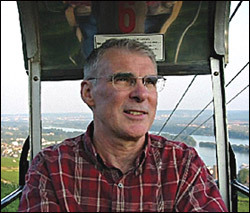 Other race scientists who have participated in FFTF's events include Michael H. Hart, who describes himself as a "white separatist" and attends conferences put on by American Renaissance (other attendees have included David Duke and other racist leaders), and Michael Levin, a professor of philosophy at the City University of New York who believes that whites are genetically superior to blacks. Citron defended his longtime colleague and friend as a "wonderful man," saying that he didn't think Kistler was a racist but that he had a "distorted view of race." But he added that Kistler should "know better than to try to support hate groups." "It's amazing that an honorable, intelligent human being can have those points of view," Citron told the Report. "It's truly tragic."